ISBN 9789043138048. 9x12 inches. English(UK)/Deutsch/Francais/Nederlands. 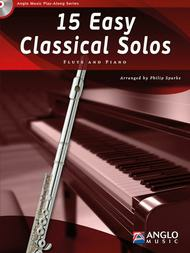 Part of the Anglo Music Play-along Series, Philip Sparkes 15 Easy Classical Solos is aimed at the young instrumentalist who can play just over an octave. Specifically tailored to suit the individual instrument, this book introduces thebeginning player to the world of the classics by using simple yet attractive melodies that fit their limited range. 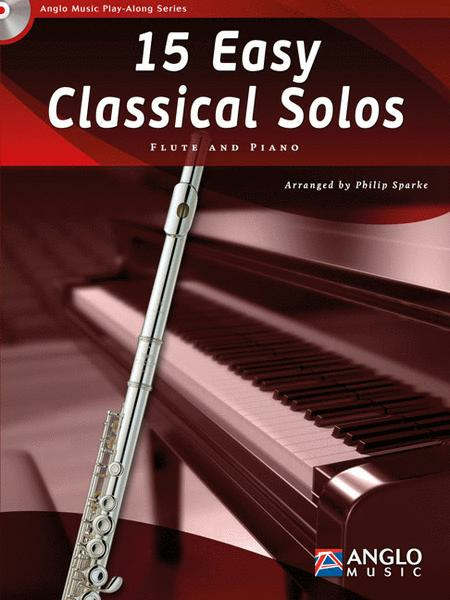 Part of the Anglo Music Play-along Series, Philip Sparke's 15 Easy Classical Solos is aimed at the young instrumentalist who can play just over an octave. Specifically tailored to suit the individual instrument, this book introduces the beginning player to the world of the classics by using simple yet attractive melodies that fit their limited range. Philip Sparke's 15 Easy Classical Solos, onderdeel van de Anglo Music Play-Along Series, is bedoeld voor de jonge instrumentalist die iets meer dan een octaaf kan spelen. Het boek sluit qua instrumentaal bereik en gebruikte toonsoortenaan bij het Artist Level van Hal Leonards Essential Elements (r), maar kan ook los daarvan worden gebruikt.De zorgvuldig geselecteerde melodieen, die specifiek zijn toegesneden op elk instrument, beslaan een breed scala van klassieke stijlen:van Bach tot Grieg en van Purcell tot Satie.Het boek bevat waardevol materiaal ter aanvulling op elke lesmethode en wordt geleverd met pianobegeleiding en een cd met demo- en meespeeltracks. 15 Easy Classical Solos ist als Erganzung zur bewahrten Anglo Music Play-Along Reihe gedacht und richtet sich an Schuler, die ungefahr einen Tonumfang von einer Oktave beherrschen. Das Niveau entspricht dem des Artist Levels der Essential Elements (r)Methode von Hal Leonard, kann aber auch unabhangig davon verwendet werden.Genau auf jedes Instrument zugeschnitten, ermoglicht die wohluberlegte Stuckeauswahl ein erstes Kennenlernen von Melodien aus verschiedenen Epochen der Klassik von Grieg uber Purcell bis Satie.Jeder Band bietet wertvolles Erganzungsmaterial, das zu jeder Instrumentalschule passt und enthalt sowohl Klavier- als auch CD-Begleitungen. 15 Easy Classical Solos, de Philip Sparke, est un ouvrage qui s'adresse aux jeunes musiciens, maitrisant un peu plus d'une octave. Specifiquement adapte a chaque instrument, ce volume rassemble quinze melodies ecrites par des compositeurs aussi varies que Bach, Purcell, Grieg et Satie. Comprenant les parties d'accompagnement de piano et une version d'accompagnement sur compact disc, ces ouvrages representent une source complementaire inestimable a toute methode pedagogique. Il concetto della collana Anglo Music Play-Along Series e quello di integrare al piu presto nel processo di apprendimento dei giovani strumentisti la possibilita di poter suonare accompagnati al piano o con l'ausilio di un'incisione su CD. Ilchiaro vantaggio di questo metodo e che gli allievi imparano da subito l'aspetto fondamentale del suonare insieme, vale a dire tenere il tempo in modo costante. 15 Easy Classical Solos consente agli allievi che hanno una conoscenza limitatadelle note di suonare brani di Bach, Schubert, Purcell, Grieg e altri, grazie alle versioni facilitate. Il livello di 15 Intermediate Classical Solos permette invece agli allievi che padroneggiano l'estensione superiore a un'ottava dicimentarsi nei "primi concerti" con brani di Haendel, Clementi, Rameau, Glueck, Beethoven e altri. Il CD propone una traccia con l'incisione completa e una con il solo accompagnamento.